This year's challenge by Amy Crow is another weekly blog based on Themes. Last week's theme was Heirloom, and I wrote about the Terwilliger Souvenir Album which has its own blog by the same name. This week, the theme is The Old Homestead. We have very few such homesteads. One of the few examples of an old homestead in our family history is found in the TERWILLIGER family history. Let's look at the TERWILLIGER Farm house - scroll down to the "Evert Terwilliger House" at the bottom of this Wikipedia page. 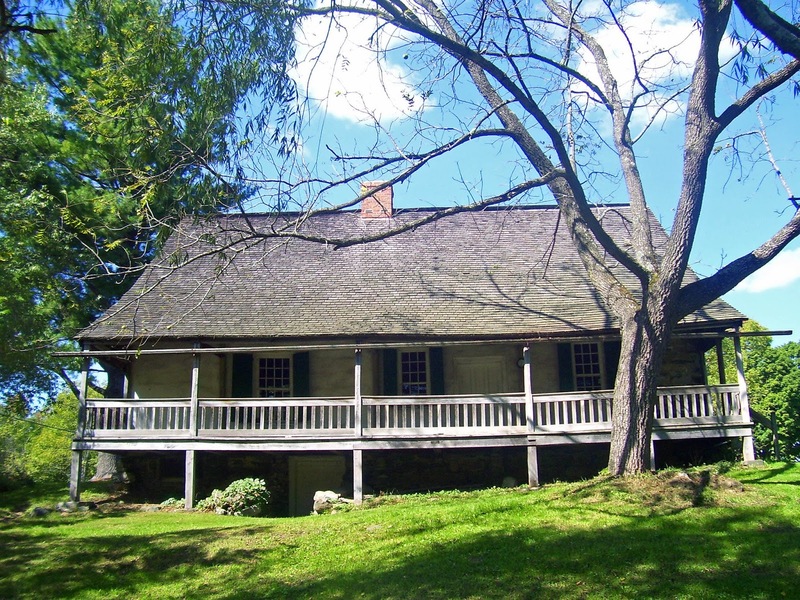 This home, a stone house, was built in 1738, by the Platekill Creek, by Evert Terwilliger, eldest son of Jan Evertson TERWILLIGER & Sytie Jacobz VAN ETTEN. Note that Jan and Sytie had 12 children which included only one girl. In March 1716/7, Evert Terwilliger married Sara Freer. The house pictured above is built on the land she inherited from her parents, Hugo and Maia [LeRoy] Freer, Huguenots. The house shows the wide gabled porch running along the front, which is apparently a common architecture feature of the times. This house was apparently extended by Evert and Sara's son, Jonathan in 1764. Stones of the house are incised with initials of several family members, Terwilliger, and Freer. Many of the Terwilliger family members settled in and near Shawangunk, Ulster, NY, a little south of New Paltz. Our family's TERWILLIGER line goes through Evert's younger brother, Johannes TERWILLIGER, who married Katrina HEYPSE/Heaps, 6 Sep 1717. 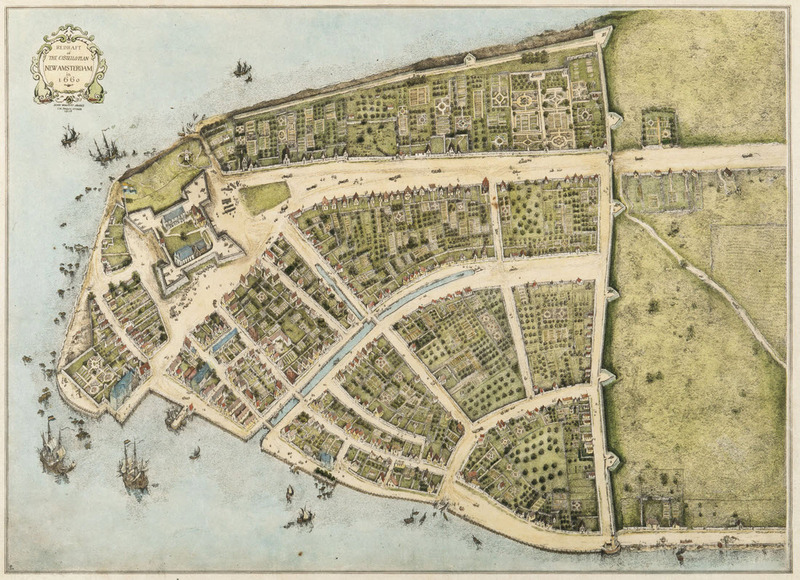 The TERWILLIGER surname is a made-in-America surname, developed when the British took over New Amsterdam and the Dutch settlements in North America, in 1664. By 1690, the families were using a version, spelled in many various ways. Some of the early ones were "Der Villig" "Ter Willig" "Tervilge" and others. The website of TERWILLIGERS IN AMERICA, Inc., has information for anyone attempting to research their Terwilliger line, of whichever spelling used. If you have information about the TERWILLIGER home, or families, I am happy to share, and also to correct any incorrect information which may be here. You can reach me at calewis at telus dot net, or in the Comments below. Blogger is still not letting me "reply" to your comments, for some unknown reason. If I don't reply to your Comment, please know that I'm totally thrilled you came to read my post and commented! You truly make my day. This year's challenge by Amy Crow is another weekly blog based on Themes. Last week's theme was Wedding, but I didn't follow the theme. This week, the theme is Heirloom. The biggest 'heirloom' I have and hold, is the incredible TERWILLIGER SOUVENIR ALBUM, from my great-grandfather, James Grover "Grove" TERWILLIGER. 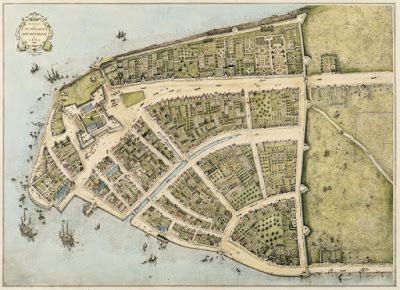 He is my mother's mother's father, and this line goes back to when our original settlers arrived in New Amsterdam in 1663, on the ship "Arent" [the Eagle]. Note the vertical wall boundary on the right - this, I believe, is the site of Wall Street! To the right is a photo of the old, worn, Album. I am very grateful to have received excellent guidance in keeping the album 'comfortable' in order to reduce the deterioration. One day, perhaps, I might be able to pay for an Archivist to assist in protecting it further. Items in the Album are dated from 1840-the very early 1900s. Here is a link to my other blog, where I am very slowly inventorying every page of this Album. It's a slog. Sometimes I'm very excited or amused about the pages, other times, I have no idea why I'm doing this. There are pages towards the back which contain wonderful details leading me to more of my ancestors: the ORMSBEE relatives, more of the GRAVES and TREAT relatives. I want to dip and pick which pages to do, but the truth is, each page needs to follow logically and methodically, so that it is - in fact - inventoried. At the rate I'm going, it will take 5 more years! Ah well. One page at a time. Some pages include photos - here's one example, which I won't be getting to for many months. I have no idea who those people at the bottom of the page might be... not a clue. Dates? Names? Relationships? Reasons for the photos? Are they related to the various ephemera on the same page, or randomly glued down? No idea. One page more or less in the middle of the Album which is particularly fascinating, is what I call his "Button Page". Filled with various political buttons, this page has many names for political election compaigns, as well as other ephemera pinned to the page. But there are many pages to go before I even begin to inventory this page. And I'll likely need an American to help me with who's who when! And, finally, here is the final 'page' - the inside back cover of the Album. Filled with newspaper articles, obituaries, and other details of people. I had no idea who most of these individuals were until I began my genealogy searches. I can hardly wait until I can inventory each one of those newspaper articles! Not all are labelled with dates of the publication, nor with the publication title itself. More research will be needed of course... Never-ending. If any of these people are your ancestors as well, please contact me via calewis at telus dot net, or in the Comments below. I would love to learn more about my various ancestors. This year's challenge by Amy Crow is another weekly blog based on Themes. Last week's theme was Commencement / Beginnings. This week, the theme is Wedding and I'm writing about... NOT Weddings. I couldn't find any wedding photos or wedding stories, nor is there any particular tradition/history about weddings. On the other hand, here is Bangor Church where the children of George HUDSON were likely married, in Pennsylvania! I've chosen to write about George HUDSON/HUTTSON, who emigrated from Wales to Pennsylvania, possibly along with the MORGAN family (Thomas MORGAN). George was the 8th of the 9 known children attributed to Charles HUDSON and Joice/Joyce (unknown), in Pembrokeshire, Wales. There were only 2 girls in this family - another male-heavy line in the family. George HUDSON is my 6th (my children's 7th) great-grandfather. This HUDSON family, written as Huttson at times, apparently immigrated sometime soon after 1720. He was one of the earliest settlers in Caernarvon township. George is listed as receiving a warrant for 400 acres of land reaching south from the King's Highway and west of the land of Gabriel Davies. An early map of Caernarvon township showing land boundaries may be seen in this link; scroll down, and under Lancaster county, select Caernarvon township. This is a wonderfully detailed map - I've spent hours poring over it! George left a very detailed will, apparently written on 09 Dec 1746 but not witnessed until 10 Jul 1747. A Codicil was added and then witnessed on 15 Sep 1747. The will was probated on 11 Apr 1748. It lists the children, a number of grandchildren, describes his youngest son William as living in Louisiana, and other family details. A transcription of the will may be found here. The person transcribing the will used [sic] for all unusual or mis-spellings. Of course, spelling as we all know, was somewhat irrelevant at the time, and although correct, I find the constant [sic] quite intrusive to reading it. I've taken each sentence and separated it, to clarify each item and each person in the family. His will affirms that he and Margret had no children, as he states "...she having no Child of her own nor neare relation in this Country...", and his will appears very generous in looking after her. Margret died before 3 Mar 1761, almost 13 years after George's death. George provided funds to the Bangor church to build a stone wall surrounding it, plus yearly funds from his land estates to the church. The Bangor Episcopalian church, originally built around 1722, is a National Heritage building, and there is apparently a plaque inside the church mentioning him. Here is where more information may be found on the HUDSON, MORGAN, & other Welsh surnames in the interior area of Pennsylvania: Click Link.